Movies and TV shows can serve to highlight their filming locations and lead to heightened tourism and exposure for those areas. For example, fans of Peter Jackson’s The Lord of the Rings film series can choose travel destinations based on “Tolkien Tourist” hotspots, most notably filming locations in New Zealand that comprise the on-screen Middle-earth. The Hobbiton movie set is the well-known Shire, and hiking the Tongariro Crossing is commonly called the “Mount Doom” hike. By visiting these locations, fans can live the films they love. But what about fans of animated films, which have no real-world filming locations? Where possible, both fans and aspiring tourist destinations seize the opportunity to transform popular animation into real-life experiences. One of the most beloved animated films globally, Spirited Away (2011), is one such film that has brought an on-screen world into reality. Produced by Studio Ghibli and directed by the famed Hayao Miyazaki, Spirited Away is one of the highest grossing Japanese films of all time, earning over $289 million worldwide. It is the only non-English nomination to win the Academy Award for Best Animated Feature, and boasts a 97 percent rating on Rotten Tomatoes. Western celebrities, such as Ariana Grande, even have tattoos and related fan art of the film’s heroine, Chihiro. 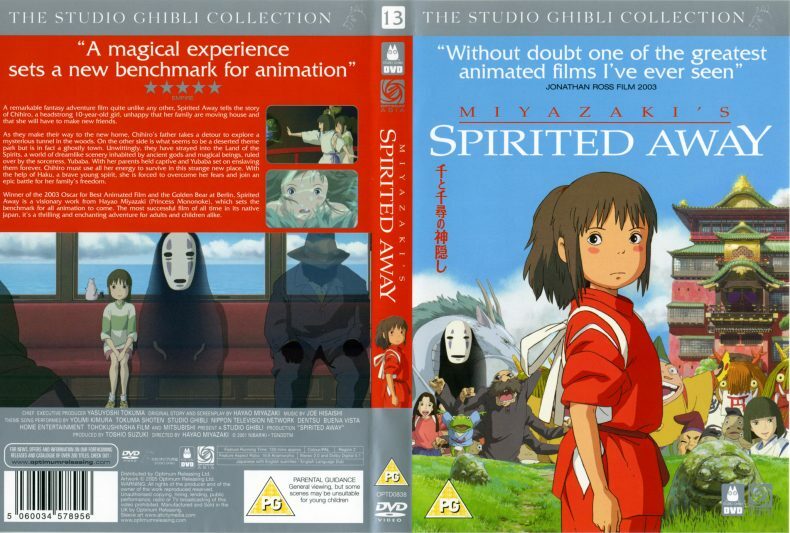 A photo of the cover of the DVD of Spirited Away, featuring a tea house on the right. Photo via amal-fm, Flickr. Although Spirited Away is hand-drawn animation, Miyazaki is rumored to have been inspired by several real-life locations. 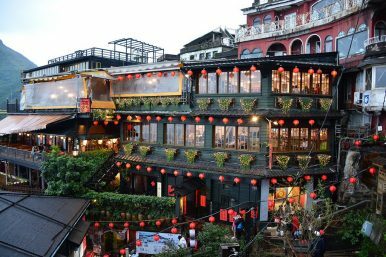 The most recognized is Jiufen, a small, former gold-mining town just 30 kilometers outside of Taipei in Taiwan. The most famous sight in Jiufen is the A-Mei Teahouse. A-Mei is said to have influenced the film’s setting of a bathhouse, and today its entrance invites customers to “imagine the legendary tea house of Spirited Away, taste the tea, [and] go beyond the real world of Jiufen.” Beyond the Spirited Away souvenirs nestled in shops lining its crowded alleyways, Jiufen more broadly pays homage to Japanese animation with references to My Neighbor Totoro (1988), among other collaborations between Miyazaki and Studio Ghibli. As a result, Jiufen has become a destination for Japanese tourists eager to live out Japanese culture, in an inherently non-Japanese context. The famous A-Mei Teahouse in Jiufen. Photo via greggman, Flickr. This trend stretches beyond animated films as well. 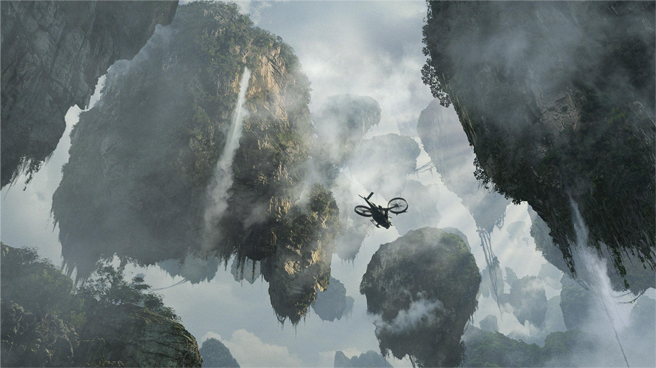 James Cameron’s 2009 box office hit Avatar created the larger-than-life world of Pandora using live action filming techniques and expensive computer-generated imagery (CGI) in post-production. Similar to Spirited Away, Avatar is a film instilled in the international imagination. It is the highest-grossing motion picture of all time with a worldwide box-office of over $2.7 billion. Nominated for nine Academy Awards, it took home prizes for Best Art Direction, Best Cinematography, and Best Visual Effects. The mystical Hallelujah mountains from Avatar. Screenshot, 20th Century Fox. One of the most iconic features of Pandora is the Hallelujah or “Floating” Mountains, immense rock structures suspended in mid-air, complete with trees, interconnected vines, and waterfalls. 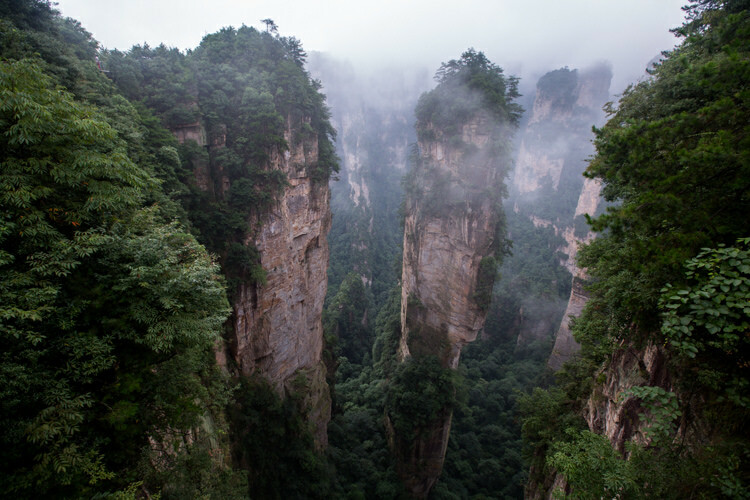 These mountains were said to be inspired by the karst structures in Zhangjiajie National Forest Park in China. Located in the UNESCO World Heritage Site of Wulingyuan Scenic Area, Zhangjiajie was recognized as China’s first national park in 1982. In 2008, just before the release of the film, the Chinese National Tourism Administration awarded the area an AAAAA designation, listing it as one of the most important tourist attractions in China, alongside fellow World Heritage Sites of the Great Wall and the Forbidden City in Beijing. As a result, tourism in Zhangjiajie has boomed, drawing both domestic and international tourists. Whether or not Jiufen and Zhangjiajie are the true muses for Spirited Away and Avatar, fans have embraced them as the real-life embodiments of impossible worlds. Transporting a beloved, on-screen story to a specific, accessible location brings new meaning to the films themselves, realizing the fandom’s imagination as both fantasy and reality.